I recently paid a couple of visits to Ouse Washes, a nature reserve managed by the RSPB, which houses two diversion channels from the River Great Ouse and is the largest area of frequently flooded (for an average of 22 days per year) grazing marsh in Britain. The sun broke out intermittently, before disappearing for the day. My first visit was under a very bilious looking sky, full of fidgety, tumbling clouds which let through the odd ray of sunshine here and there, as if they were uneasy with the whole concept, and wished to hoard it for themselves. These ruined houses were the only structures to be seen. 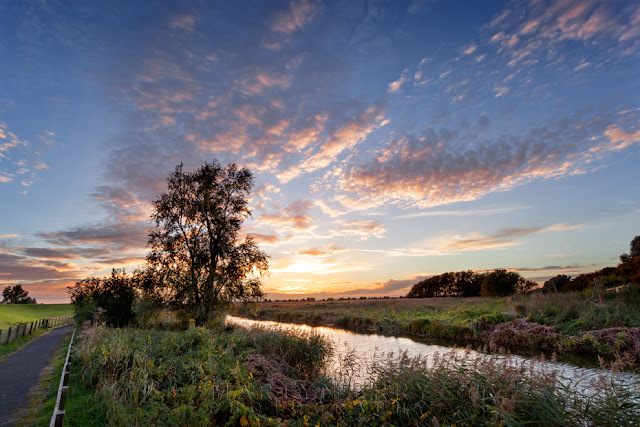 As the reserve is located deep within the agricultural rusticity of the Cambridgeshire Fens, the surrounding landscape is unrelentingly flat, not a town or village on the horizon, and apart from a few trees, very little of anything to divert the eye. Add to that the fact I didn’t see a single other person the whole time I was there, and it all added up to give the place a rather peculiar quality. The vibrant red of the tree is in contrast to the general atmosphere. 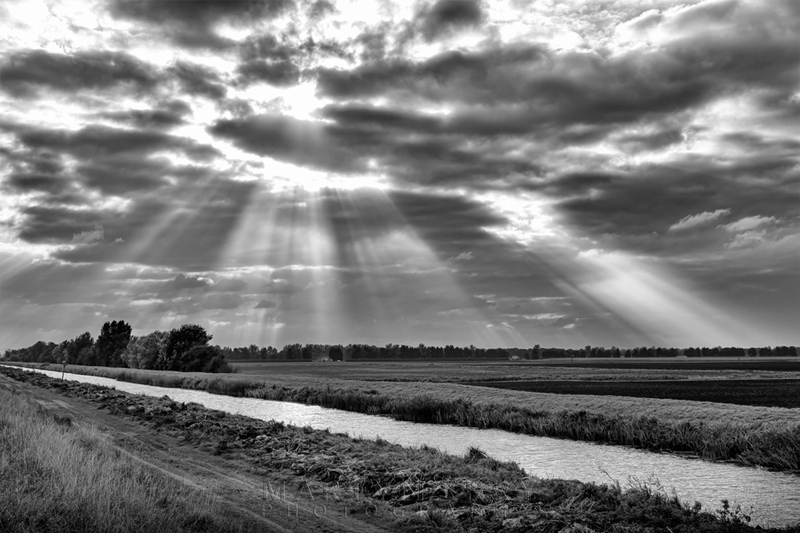 The two rivers, the Old Bedford River and the New Bedford River (also known as the Hundred Foot Drain), were begun in the 1630’s, and thanks to an extended hiatus on construction, due to the intervention of the English Civil War, they were finished in 1652. One of the drainage channels courses through the empty landscape. Some of the workers who built the New Bedford River may have been Scottish prisoners-of-war captured at the Battle of Dunbar, since a number of such prisoners were used on drainage schemes in the Fens, because labourers were scarce. 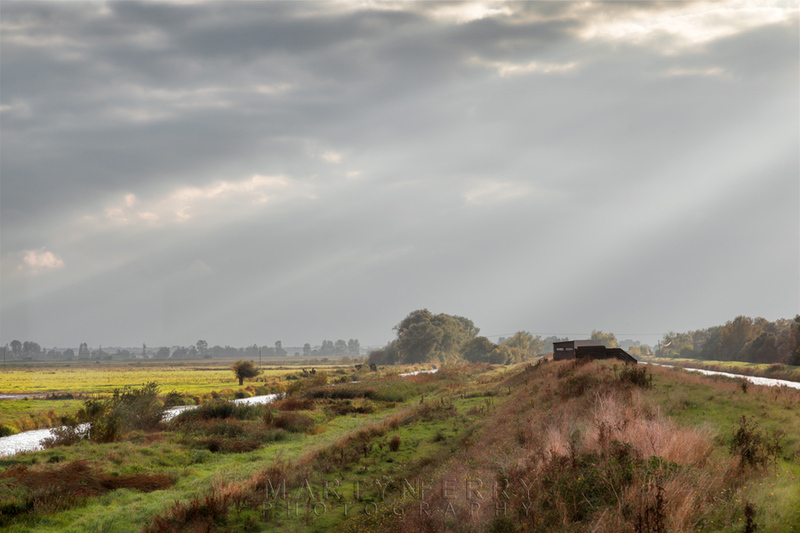 After 1652, they were supplemented by Dutch prisoners, the result of sea battles during the First Anglo-Dutch War, and probably by a colony of French workers stationed near Thorney Abbey. One of the, what I can only assume, were abandoned houses. I'm guessing they were prone to flooding. These silvery leaved trees made a stark contrast to the greens and browns all about. A collection of tree shapes in the waning light. The reserve is of national importance for Bewick's swan and whooper swan. It also attracts wintering birds of prey, including hen harrier, merlin, peregrine falcon and short-eared owl. Redshanks, lapwings and snipe breed on the Washes in spring. Looking along the banks of the rivers, towards one of the bird hides that dot the route. My next visit was enlivened by a particularly nice sunset, which I was pleased about. When I got there it seemed even most of the birds had deserted the place, so my binoculars had very little to occupy them. I’m not a bird watcher, and I have no idea what I’m looking at, (as regards species, I know they’re birds) but I don’t mind a bit of wildlife spotting when I get the chance. Clouds seem to pour out from this riverside tree under the warm light of the evening sun. After a couple of hours watching a few ducks bob about, and witnessing a couple of pheasants kick off, I was ready leave, but walking back to the car I could see that there might be a bit of a sunset commotion above, so I stuck around, and I’m glad I did. 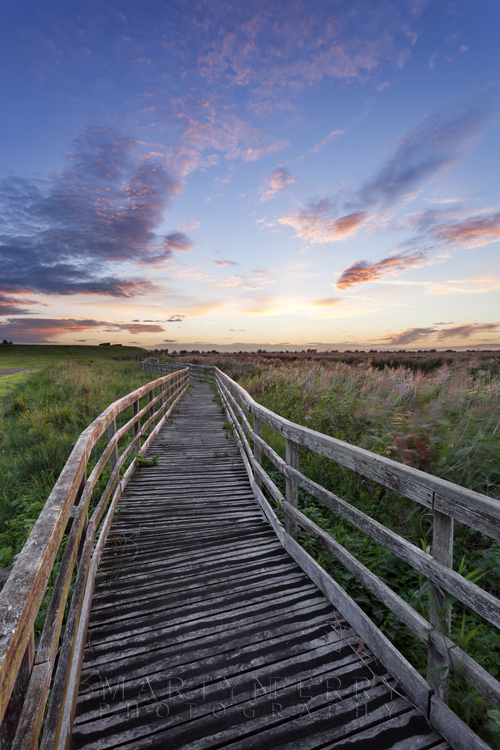 This walkway traverses over marshy, reed covered ground. It leads to one of the hides, and it also makes a very handy prop for use in photos. A selection of wispy cloud images as they catch the last of the colour. And I leave you with a nice peaceful shot of some reeds with the reflection of the evening light imparting a tangerine sheen the river behind them.